Us during last year's Teachers' Day Dinner. We were one another's pillars of strength back in school. 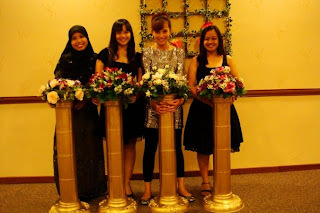 Picture taken during Nad's wedding. And Nurul was VERY heavily pregnant. Nurul and I- Allah answered our prayers last year because we ended up teaching the same level. We were rejoicing like lil kiddos when we found out! Nevertheless, she lives just 5 minutes away from me so it's no biggie actually. I miss my breakfasts, brunches, lunches, PDTs and poking fun at woof woof L with you babe. 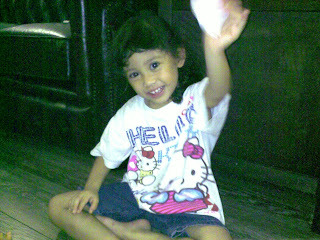 Picture taken during Nyla's 4th birthday party. This Ray truly lives up to her name. She is our ray of sunshine in each of our lives. This babe is freakin' pretty and even freakin' prettier inside. My mentor, this one, to become a true beauty. Never once I have seen her frown. Always smiley. Cair beb! The best part: Her mom was my favourite History teacher when I was in YISS and she is happily dating my cousin. Babe, you are going to be part of my family man! Insyaallah! Picture taken during last year's National Day Parade. Our Nad here is a person who is very very obliging. Sometimes we tend to get frustrated because ocassionally, this lass is too kind to those who do not deserve her kindness. She is such a sweetie and will never do anything to hurt anyone. She is an extremely humble woman and I am very fortunate to befriend such a wonderful person like Nad. I am sure the rest of the girlies share the exact same sentiment. The best part: She was my JJC mate. Then, we exchanged hellos and byes. Now, I pour out my whole heart to her. These 3 ladies had an extremely long and exhausting day today. So when they suggested to come over to my place to chill (and also to pass Nyla's gift because Nad and Nurul couldn't attend her party last Sunday), how can I ever have the heart to turn them down? Babesies, you've come to the right place. And at such a right time. HUGS! Too bad I didn't take a shot of the homecooked meals I whipped up for them! With lots of love, no doubt! See how hard they try to hide their tired faces? 4 years ago was, by far, the most memorable moment of my life. My dearest Nyla, you have thrusted me into this place halfway between feeling ultimately blessed and also terrified about getting it wrong and not being up to the job. I love you, babe, with all my heart. Happy birthday my sweetheart and I hope you truly enjoyed your birthday party with your favourite people. Thanks Aunty Wati for the birthday cake! 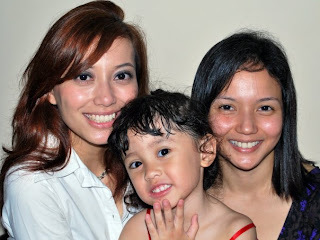 With my siblings and cutie Rooqy! Thanks Bah and Netty for the magic show! Magic show in action much to the delight of the kiddos and the adults who can chat and eat in peace! Cos this is what happens when there isn't any magic show. They'll start to stray. Hehe! Hope you kiddos had a blast! Many thanks to Shofi the photographer who didn't sleep a wink the previous night! I have always loved (and still do!) collecting a variety of recipes from blogs. I even bought a few recipe books which were sadly placed on the highest shelf. After looking at the mouth watering pictures of the food, I'll always design some delicious mean meals in my imagination. Well, let's just say that I am someone who has always been interested in diet and nutrition, but somehow it was just impossible for me to translate that passion into practice. I mean how to when I was never at home for breakfast, lunch and dinner. I am definitely not exaggerating here. Teaching, which comprised of the lesson planning, the marking, the setting of exam scripts, the admin stuff, took up that much of my time. So, naturally, cooking took the back-est seat. One of my goals after I quit work is to learn how to cook malay dishes because my mister absolutely digs those assam pedas, sambal ayam, sotong singgang and whatever melayu dishes there are. I've been cooking up a storm in the kitchen the past few weeks. Yup, finally put those dusty cook books to good use. And finally after so many years, I have learned how to cook ayam lemak cili padi, thanks to Di and her momma! We rarely eat out ever since I turned into Rachael Ray. Hah! I must also thank my mom (the smartest lady in the whole wide world) who taught me how to cook in bulk then freeze in small portions. My freezer currently boasts some authentic malay dishes that can last my family a whole month. Now would you excuse me, the husband is coming home and they say that the way to a man's heart is through his stomach. Menu for today I hear you ask? It all started at about 6.30 p.m. The little girl in the picture above actually thought that she would be included in the wedding anniversary celebration. Just look at that beaming face. Unfortunately the couple in the picture below didn't plan it that way. So they waved goodbye to their little girl who obviously went from beaming to screaming in a matter of a few seconds.. So sorry about that babe. When you get older, you'll understand why couple time is very important especially for mommies and daddies. The couple, by the way , appreciated their time together as seen by the pictures. Then, they decided to call it a night and fetch their little girl who, judging by the picture below, seems not to hold any grudges. She hugged and kissed her parents, instantly forgetting her anger towards them during the initial part of separation. It has been a wonderful evening. You're everything to me too, Mr Esman. I don't think I have ever told you how I felt the first time we met. I was only sixteen then, you see. I was supposed to be having crushes on boys in my college. Not a guy who has lived through one entire zodiac cycle ahead of me. I found you so cute then by the way. Your eyes were (and still are!) beautiful they reminded me of Robbie Williams. Haha! I knew I told you this but you didn't take that as a compliment because you mistakenly thought I was referring to Robin Williams the Patch Adams guy! Chet! And when you first winked at me, you have absolutely no idea that my knees were shaking. Haha! I guess love at first sight really does exist huh. Ten years have since passed that first connection and today marks our 5th year wedding anniversary. I never thought we would be where we are today married with a child! Everytime I am with you, I feel safe to be myself knowing I can not be perfect and yet, you still continue to love me. Thank you for making my life richer and continually inspiring me to do better and be a better person. You are my greatest cheerleader you know that! Meanwhile, Happy Anniversary and I love you! My parents have returned safely from Dubai and Nyla missed them terribly. So much that she decided to spend the night at my parents' place. Of course both Esman and I had to fake being upset in front of her but deep deep down, we were like "Yahooooo!" Like finally we get some twosome time. Ehem Ehem! Then Esman, being the hardworking and dedicated man that he is, decided that he meet his friend to discuss some work matters and told me that he would drop me off at home first. Of course I was disappointed because all hopes of snuggling on the couch and hot tea and DVD and .. were all dashed! However, I know that he is working hard for the family and I appreciate that very much. I could sense his sadness as I got out of the car. I was back to normal when I reached home though. No longer felt upset because I myself had some tuition stuff (and facebook updates!) to do. As I got settled in front of the computer, I heard someone at the door. Honey, you have been real sweet to me over the years but what you did just now totally blew me away. We all know that children need experiences with mathematical concepts to develop their skills as they get older. Being an experienced teacher dealing with pupils who struggle with Mathematics, I am totally aware that I cannot 'teach' Maths but what I can do is to provide experiences for playing and living with Maths. 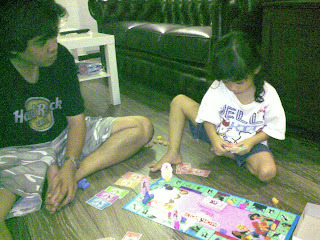 I am very pleased with it because it is very easy for Nyla who is a beginner in the board game world. It was a breeze explaining to Nyla the rules of the game. 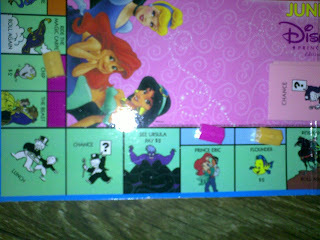 Playing pieces are cardboard cutouts of the princesses (Sleeping Beauty, Cinderella, Little Mermaid (Me), Jasmine(Esman, just going with the flow! hah! ), Snow White, Belle (Nyla), Mulan & Pocohantas) instead of hats, dogs or thimbles. Nyla had so much fun rolling the dice and moving her Belle without having a clue at all that she was having a Mathematics lesson last night! Great stuff! It has counting, rolling the dice and moving spaces, early math using play money kept in small denominations :$1,$2,$3, $4 and 5 dollars. She has also picked up some entrepreneurship skills by choosing to purchase the property. Yeay! Mommy paid me rent! 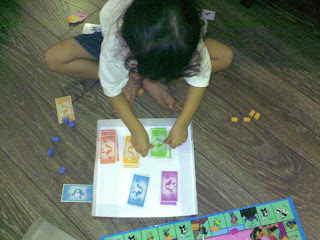 Nyla counted spaces as she moved around the board, counted money as she bought property, paid rent..etc. Reading skills is not really necessary here, in my opinion. Nyla is beginning reading and is working on actually reading the chance cards, but she is able to look at it and know exactly what to do. We were very engaged in the game for a good half hour. We could have lasted longer though but unfortunately we did not because somebody landed on the dreaded fatty Ursula and hence required to part with her $2. 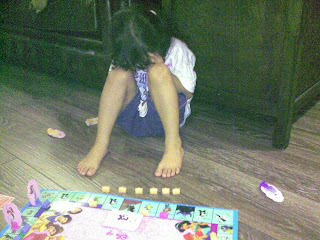 And also refused to continue playing the game. I started very early in the morning but it was no big deal because I absolutely love working with this girl called Alfarahizah Awangnit. I also absolutely love working for this clothing line called First Lady which is so popular among the Malay community and will be swarmed during sales and especially during the festive seasons. How can I forget this guy whom people have mistakenly dubbed him as the next Suria artiste. Hah! A very avid photographer of.....himself. And also Lynn who had to endure my morning breath and puffy eyes and work her magic on my face. Thanks Lynn of L.A.B for clearing my nose. huahuahua! While I was having fun...oops...working, Mr Esman was very kind enough to take over parenting duties during the first half of the morning. I rushed the moment the shoot ended because Esman was already waiting with the babe who was all dressed as D.W (the super duper typically annoying but cute lil sis of Arthur Read) for Character Book Week in school. Fun stuff! Nyla loves the Arthur Series by Marc Brown and it was no surprise to me that she wanted to dress up as Dora Winifred Read! Well what else to say? Awesome day it was for both the mommy and the babe!